Lex blog - Hamradio - Tuinbaan - LGB - Modelspoor - Fotografie - Nearby lightning discharge and a LoRaWAN Gateway. Because I wasn't at home when a major thunderstorm hit the Netherlands on 9 august 2018 I couldn't shutdown my Lorank8 gateway and disconnect the antenne before the storm hit Almelo (ok, shutdown was possible by SSH but disconnecting a antenna is a physical thing). 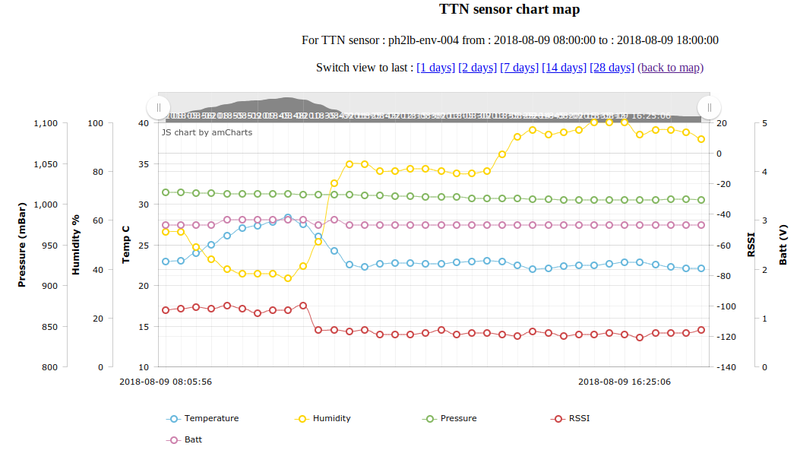 From my work I monitored my TTN Enviromental map for the storm to hit and saw the sudden rise in humidity and drop of the temperature when the storm hit my home as you can see in the image below (timestamps are in UTC). But also a major drop of 16dB on the RSSI (link). Because of the large amount of rain in that store I hoped that the antenna or cable had some water damage and after some cleaning this problem would be fixed. But measering the antenna and cable which seemd ok, I changed the antenna and cable just to be sure. But no increase of RSSI was to be seen. So I feared that the RX part of my gateway would have been damages by a nearby lightning discharge. Early Juli 2018 I was asked by Wietse ter Haar (who lives in my area) for some support on his graduation assignment involving a LoRaWAN case. He also told me that he is very interested in weather monitoring and had a professional weather monitoring system incl a professional lightning detector who sends data to a central server. So when I told him about my findings he was willing to search data for a lightning map of 9 august 2018 and send me a animated GIF of that day. He also told me that a had some discharges to close for comfort near my home and so the location where the LoRank8 gateway is installed.